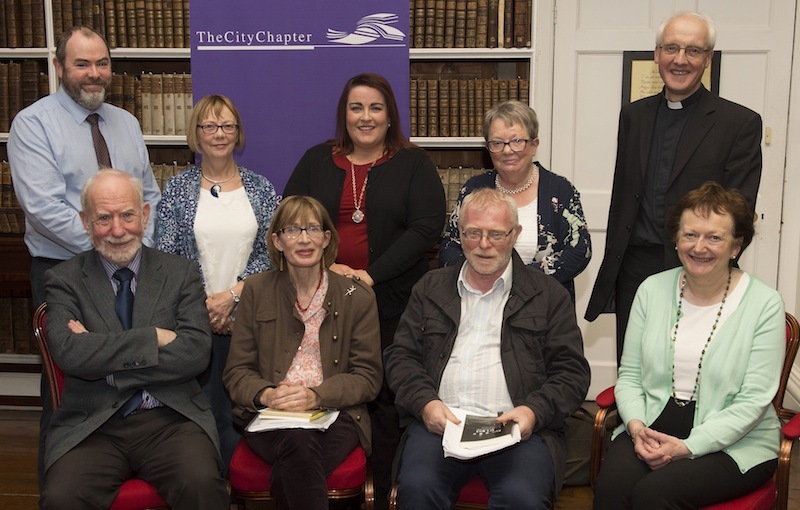 National Poetry Day was celebrated in the Library with poets Ruth Carr and Frank Ormsby, organised by the City Chapter in association with the John Hewitt Society and supported by Armagh City, Banbridge and Craigavon Borough Council. In the photograph are, seated from the left: Paul McAvinchey for the John Hewitt Society, Ruth Carr and Frank Ormsby – the two poets, Carol Conlin – Chairperson of the City Chapter. Standing from the left are: Roddy Hegarty – committee member of the City Chapter, Helen Grimes – Hon. Treasurer of the City Chapter, Patricia Curran, new representative on the City Chapter for Armagh City Library, Mary McVeigh – committee member of the City Chapter, and Dean Gregory Dunstan, Keeper of Armagh Public Library.